Professor Matt Rosseinsky, who led the research, said “These porous materials use the same atomic-scale mechanisms as proteins to switch between structures, which gives us the opportunity to develop new ways to manipulate and change molecules with synthetic materials that are inspired by biology. 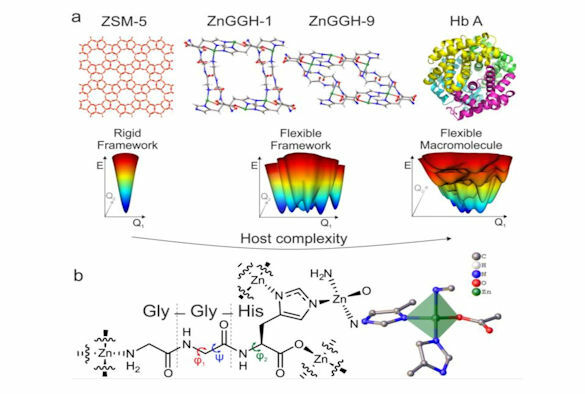 The paper `Chemical control of structure and guest uptake by a conformationally mobile porous material’ (doi: 10.1038/s41586-018-0820-9) is published in Nature. The research team, from the Department of Chemistry, is based in the University’s Materials Innovation Factory, an £81 million project dedicated to the research and development of advanced materials. The facility, established in collaboration with Unilever, brings together materials chemistry expertise with the latest computational and robotic equipment to accelerate research and reduce the development time for new products to address societal needs. This research was supported by the European Research Council (ERC) and the Engineering and Physical Sciences Research Council.